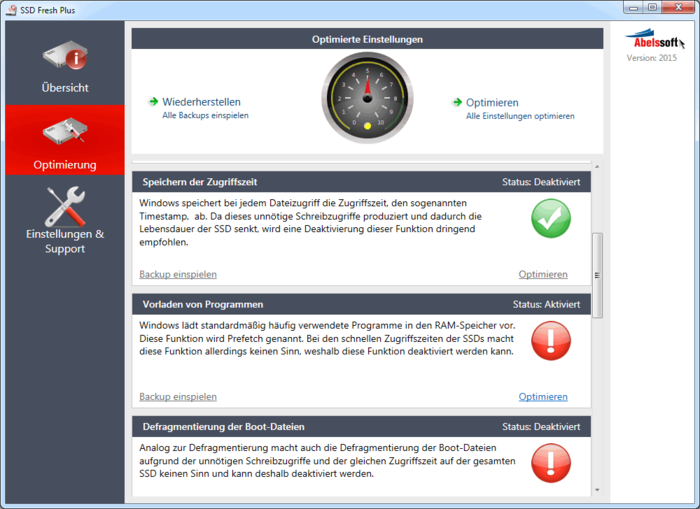 SSD Fresh prepares Windows systems prior to the optimum use of solid state drives. The free helper turns off SSD unfriendly Windows services and offers tips to optimize performance. SSD Fresh requires free registration with an email address during installation. If one has entered its data once the freeware starts. The main view of the SSD tool is divided into three tabs. In the category "Overview" the user learns details of installed Solid State Drives. In the tab "optimization" users get tips and screws to optimize SSD performance. The SSD Fresh available in a paid Plus version optimizes the Windows access to SSDs, which promises a longer life by the manufacturer. This is achieved among other things by deactivating the defragmentation. The latest version comes with Windows 8.1 and rightly supports AHCI settings. Disabling the Windows Disk Defragmenter at a SSD disk is useful because SSD drives to access the same rate to all memory cells and the data is written not necessarily in contiguous blocks in the sectors. Rather, the relevant writes ensure a reduction in the lifetime of an SSD hard drive. SSD Fresh is aimed at beginners and professionals in the field of SSD alike. The free helper provides useful tips and settings so that you can exploit the full performance of the fast disk.